I think I've eaten just about every flavor of Ben & Jerry's ice cream available, but I was scared to death of their new "Mission to Marzipan" for two reasons. The first was that I had no idea what marzipan tasted like, and the second was that I heard marzipan is extraordinarily sweet, and I don't really care for that. After talking with Mom, who told me that marzipan tasted like an extra sweet almond paste, I felt a little more confident about trying it. Almonds are good, right? I reassured myself of this as I lowered the pint of ice cream into our shopping cart ($3.99). I couldn't believe that after weeks of seeing this flavor and talking about how I would never try it, it was finally on its way to my home ... and my stomach. To be sure that I was not the only one who would be going into diabetic shock as I tried it, I gave Mom and Dad each a spoon so they could have a taste. 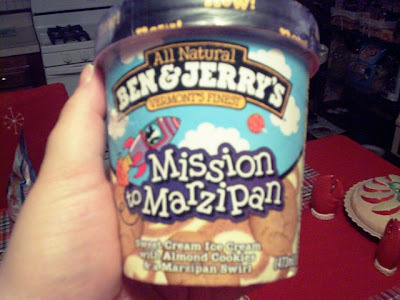 THE VERDICT: According to the label, Mission to Marzipan consists of a sweet cream ice cream mixed with almond cookies and finished with a marzipan swirl. When I first opened the pint, I thought that it had a bit of freezer burn. What looked like a thick layer of ice crystals had formed around the top of the ice cream. I quickly rechecked the bottom of the container for the expiration date - October 23, 2010. 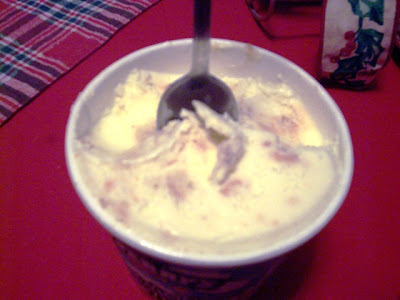 Mom explained that the crunchy "ice crystals" I was seeing - and hearing as I dipped my spoon into the ice cream - was actually the marzipan swirl (a.k.a., sugar). WOW!!! How much sugar was in this thing? A hundred grams? Yep. We soldiered on. As I took my first taste, I was surprised at how much almond flavor was actually in the ice cream. Believe it or not, it was good! The crunchy marzipan swirl was mixed throughout, but fortunately Ben & Jerry didn't play up that angle too much. 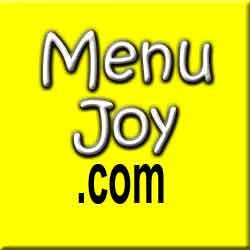 Their focus was more on the almond cookies and the sweet cream ice cream, which went very well together. I ate it quickly and decided to take my blood sugar right afterwards just to see if I was going to make it through the night. Thankfully, I wasn't on the verge of a coma, and neither were Mom and Dad. Like me, Mom was very leery of tasting the ice cream, but was pleasantly surprised when she found that the predominant taste was almond. Dad felt the same way, and agreed with us that the ice cream was sweet, but not sickening. All in all, this was definitely a Bite that I thought was going to be a bomb, but instead, it reminded us all never to judge a book by its sugar-coated cover.